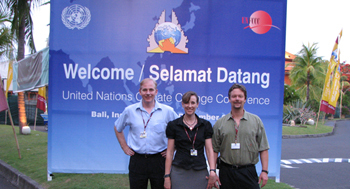 There were 12 of us skeptics among 12,000 believers at the Bali UNFCCC in 2007. 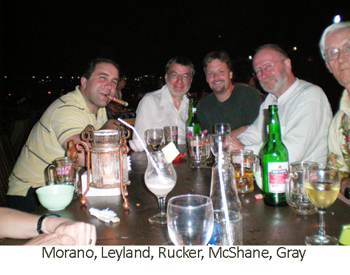 We were a rag-tag team of passionate people, some of whom had PhDs, and most of whom were not paid to be there. We came because we were angry about the way science was being exploited. It was a convention on a scale I had not seen before. Not just 2,000 for a weekend, which would be big, but 12,000 for two entire weeks, which was an extravaganza. 12,000 people for an two entire weeks was an extravaganza. 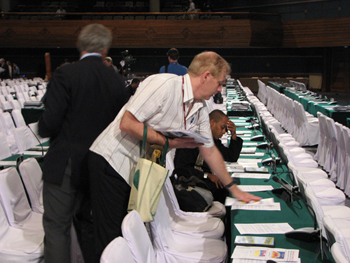 The UNFCCC meetings define the term “junket”. These mass climate conventions happen every year in locations like Nairobi (Kenya), Poznan (Poland), Montreal (Canada), Buenos Aires (Argentina), and Milan in Italy. Copenhagen is COP 15, meaning there have been 14 before it. (And at two weeks each, that’s over six months of non-stop PR and “staff incentives”.) Is there any larger yearly congregation in the world? From the outset the UNFCCC did everything it could to maintain the appearance that it is a fair, transparent, and scientific based organization. Yet on the ground, it did everything it could to make sure that there would be no dissent, no debate, and no free speech unless it was their official line. The UN are not trying to promote humanities search for knowledge, instead they exploit climate science as a tool to increase their own power. Once again the western media let down the public. The UN got away with being anti-science, and anti-free-speech. The tactics and incidents described below seem minor, but it’s indicative of a deeper systematic censorship what we’ve seen in their assessment reports. Only the light of the media would keep the UN on it’s leash, and the western media are out to lunch. (until the UN discovered us and evicted us). When booking the event, Greg Balle described the process: all interested parties were told there was a set period (of about two weeks or so) to book rooms and halls for presentations. But suddenly, after a mere 24 hours, it was announced that all the venues were fully booked. You could describe this as poor planning on the part of the UN for underestimating the demand for rooms, but given the way they behaved for the rest of the event, it was par for the course. It’s a good tactic to use if you want to officially allow anyone to book but unofficially filter out anyone who is not on say, your “friends” email-list. You can let select people know that the bookings will close in hours, or possibly allow them to pre-book months in advance. Environment & Climate News has been in continual publication for 10 years; is sent to more than 75,000 elected officials, opinion leaders, and environmental professionals in the United States; and is one of five newspapers published the by 23-year-old Heartland Institute. 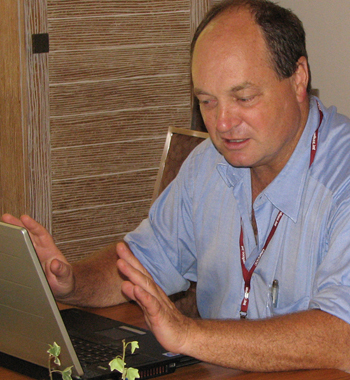 James M. Taylor, managing editor of Environment & Climate News, stated, “Ms. Assheuer’s decision is stunningly totalitarian. We were allowed to use a tiny meeting room in the secondary venue, that could fit around 20 people. 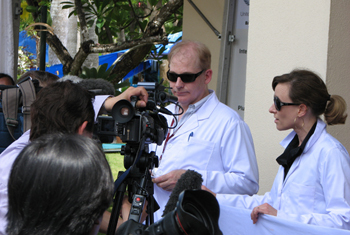 We attracted around 20 to the first event, including some of the press. Word of that success made it to the management, and part way through the second event, which had attracted a larger crowd, the UN secretariat sent an official to shut it down. The excuse? Apparently that room was only for our members to use, not for anyone else. 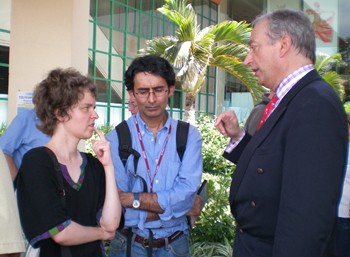 I replied that we could make all the guests members, effective immediately… Lord Monckton announced that press releases would be going out to let the world know that scientists were being suppressed. The UN officials came up with new bureaucratic rules, then rescinded the use of the room entirely. Although Greenpeace was allowed to have a two-story high icon permanently placed outside the front of the venue, and “Women for Nuclear Disarmament” were allowed to protest, (even though no one could understand why it was relevant) we had to apply to hold a banner on the street outside the main venue. Permission was granted, but then retracted (sound familiar?). Apparently with Al Gore arriving that day, there were “security issues”. We ignored the retraction. We’d hand-painted an 8 meter banner, and other groups were protesting freely even though we’d been told there would now be absolutely no protests on Al-Gore-Thursday. We were stopped by the armed guards doing bag searches at the perimeter because we were armed with a dangerous banner. They confiscated the banner– but only after reading it. It contained the incendiary words: “No Kyoto 2. New science drives out old fears”. 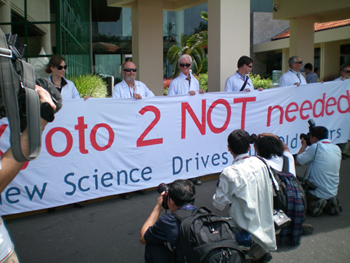 So the IPCC thinks Greenpeace has a scientific message, but eight people armed with 17 degrees (including 3 doctorates) and a tame banner was too much? 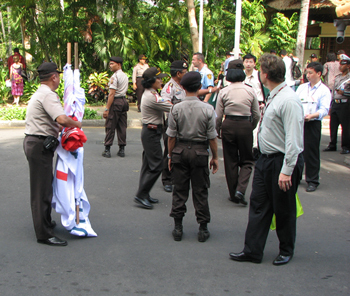 After pleas we got the banner back, took it away and then had to smuggle it with eight lab coats past the same armed guards. 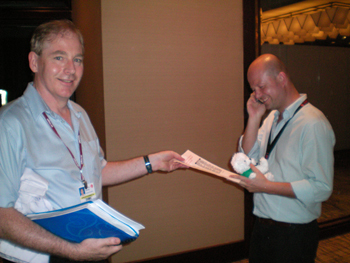 Thanks to Dr David Evans distracting the security staff with gifts of free copies of The Great Global Warming Swindle DVD and his calm poker-face, we were waved through the second time with smiles. The guards seemed delighted with their presents. The protest was a huge success. Within minutes we were surrounded by media and multiple interviews ran simultaneously and non-stop for thirty minutes. Barbara Black, a big wig at the UN secretariat, appeared very quickly. But her obvious fury was contained quickly as the camera’s panned. Journalists from everywhere except the “first” world, leaped at the chance to get a different view point. One of the ironies of this grassroots protest was that the skeptical protesters included PhDs, and the materials cost around $200. Meanwhile to expose the “oil funded Deniers”, Greenpeace had so much cash to spare they were hiring helicopters. 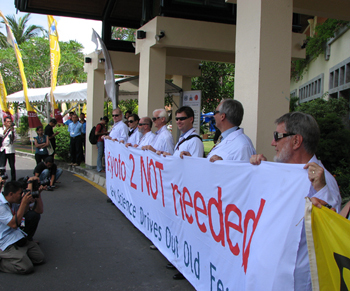 The average age of the Bali protest team was 60. 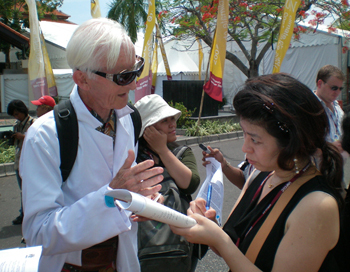 Vincent Gray, an IPCC expert reviewer, was 85 years old in the 30 plus heat, yet he soldiered on enthusiastically. It puts things in perspective, that even when Woodstock raged, he was already in his forties. We pointed out to the secretariat that while they claimed there were no venues for us to speak at, there were empty lecture halls available and surely they would not want to be seen as being afraid of skeptics. They reluctantly granted us use of an empty theatre. We complied on time and to the letter with every requirement for forms and information. But on the day, the main venue ticker announcements included only the words CFACT, and not the title or any information about the event. 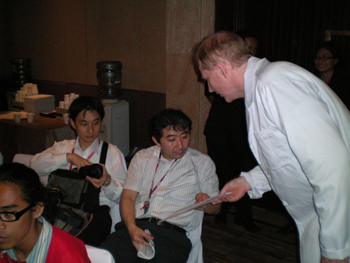 The UN secretariat were unable to explain why the official information we gave them was not publicly posted as it was for the hundreds of other events throughout the conference. Another odd coincidence. The skeptic’s best friends are color printers, cameras and YouTube. Color lazer printers produced about 7000 copies of missing hot spot graphs, recent temperature trends, copies of scientific papers, and lists of eminent professors who are disturbed by the IPCC science. Plenty of jaws dropped when full color science was on display. To all the skeptics going to Copenhagen, be armed with your cameras and your most assertive self. Taxpayers of the world keep the UN flush with funds, and they have every right to expect that the UN is acting in good conscience. The thing the UN is more afraid of than anything is bad press. After all, what if the public should get wind of how self-serving it is? What if the public understood how the UN is using their hard-earned money to create a crisis in order to trick the public into sending even more funds their way? What if citizens everywhere revolted and called for an end to this corrupt institution which pours money into inflating fake crises while people are murdered en masse in Rwanda, in Bosnia, Darfur, and Somalia: this joke of an institution which installed Gaddafi as head of its “human rights” commission. Some 15% of Americans already recognize the UN as the enemy. How rapidly will that grow once the story spreads that the UN will do anything to become a World Government, even if that means silencing honest unpaid professors of science while they endorse fraudulent work from fake pretenders? Dr David Evans helped Al Gore get the science right, by issuing copies of the 35 errors in An Inconvenient Truth before Gores’ speech. Bali was a lot of fun. Back then we were fighting a roadmap. Copenhagen is something far darker. Send your elected representatives a note. Let them know this fraud is being exposed, despite the media, and all who support it will be brought down with the scam. Simpleton that I am, I’ve always maintained that the only thing worse than a bureaucrat, is two of them. This meeting of the Carbon cartel will be different in many ways. More anger and defensiveness. More brownnosing of certain leaders. The Environmental Protection Agency today declared CO2 a toxin in America. I am left breathless. A very apt way of putting it . When will breathing become an offence ? Or at least not breathing into a CO2 scrubbing mask ? Was that mask CFACT were parading around Doha for real or just , or just for highlighting the gullibility of the anti-carbon set ? Good for you, Joanne, I’m glad for people like you working to prevent needless suffering imposed by the despicable UN. I am amazed at the restraint you all showed after so much provocation from these unelected and unaccountable bureaucrats. It has been particularly galling to conservatives here in the states that we pay 25% of the UN’s yearly budget while they work against us at every turn. To our shame we are enablers of this stuff. The UN long ago ceased to follow it’s mandate and began serving itself. Congratulations on your efforts at Balli. The press here certainly didn’t say a thing about it. Believers in evolution should not be even slightly surprised by this. Laugh or cry, you choose. Bigger yearly meet?…… Mecca! Ganges! Forget that. A fine website, thought-provoking, well-researched, uncompromising and, above all, open and honest. Re: 1200 Limos etc. I’ll bet they’ll say something like “it’s OK, we bought carbon offsets”. What a croc. That’s just a way of rich people telling poor people that they can do all the polluting they like provided they pay for the priveledge. Me rich, can do all the polluting I want, you’re too poor so you’d better not pollute. Sounds a bit like an ETS attitude to me. I hear they’re worried about the weather – rain predicted or something – gee, isn’t global cooling really inconvenient Mr Gore! Most of the 15000 hangers on could do with some exercise anyways. Someone on one of my local newspaper’s blogs came back at me with this link. Can anyone give me a relatively short rebuttal in simple terms that I can use? Well apart from going after the credibility and questionable motivation of the IPCC, isn’t the Thisd Assessment report rather out-dated to be quoting, with AR4 already about to be superseded by Advocacy Report Nr. 5. It depends on what point AR3 was being offered in support of I guess. The Skeptics Handbook (on this website) should do it. Apparently Yvo De boer’s opening remarks had some defensive reference to climategate. Maybe they want everyone to ignore the cloud that is hanging over the whole event. I’m hoping for a train smash where a block of countries walk off led by the Saudi’s. Looks similar to the UN after the tsunami in Indonesia. While we sent ships actually able to help to exactly where they were needed, the UN sent bigwigs to the capitol to stay in 5-star hotels, demand 24 hour catering service and then demand to meet with everyone and sundry to coordinate the rescue effort. When some UN people finally did show up where the US Navy was getting it’s hands dirty they complained because we managed to feed a few people twice (what a horrible crime) and pushed to get our people to wear UN colors. Fortunately our commanders knew better! You never heard a word of this from our media, but a blog run by someone in our diplomatc corps kept those of who knew where to look right up to date. Here’s another Reason why I boil over about paying 25% of the UN budget! I can’t say enough what a debt of gratitude we here in the US owe to you all down under. It has given us a blueprint for defeating cap and trade in the US Senate. However, I think an even bigger worry for us here is that our current administration will try to use our Environmental Protection Agency to attempt to implement the Copenhagen targets without Congressional legislation even being passed. 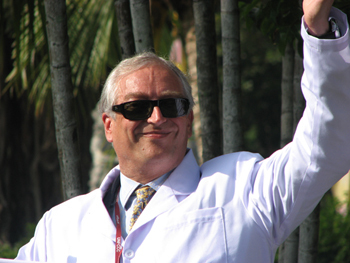 The fun is just beginning as you know Dr. Hansen and NASA have not yet responded to a TWO year old FOI request. I only hope that those involved in this fraud are removed from their publicly funded positions and I think it is not too much to ask for some to serve prison time. Great job with this site by the way. I’m a huge fan. This is just a link to IPCC AR3. The first rebuttal is that the errata link is undefined. A more complete rebuttal follows. The reason the report uses the more obfuscated form, is that otherwise, 6.1.1 does not reconcile with the constant determined for 6.2.1. Consider that an average surface temp of 288K corresponds to an average surface energy of 390.1 W/m^2. According to section 6.3.1, doubling CO2 increases the radiative forcing by 3.7 W/m^2 (calculated from equation in table 6.2) and we add this to 390.1 W/m^2 and convert back to temperature, we get 288.68K, or a 0.68K increase for doubling CO2, which is not enough to cause alarm. Another reason for the obfuscated form is that because that changes in solar energy are treated the same as changes in CO2 related forcing, the 20 W/m^2 variability in solar energy between perihelion and aphelion should be amplified by the same climate sensitivity factor, which it clearly is not. Using equation 6.1 and a ‘climate sensitivity’ of 0.5, the change in surface temperature for a change in forcing power of 3.7 W^2 is 1.85C. This is smaller than the 3C often cited, which is based on a climate sensitivity of 0.8 (this number seems to have been pulled from a hat, or perhaps AR2). In any event, it doesn’t matter whether this is .5 or .8, if we linearize the actual relationship, we get a climate sensitivity of 0.67/3.7 = 0.18, which is too small to worry about. Looks like weve got our work cut out for us – lets get behind Joanne and spread the news and get people educated. BTW how did the rally in Melbourne go? In addition to the 1500 limo’s and private jets, there are 5 hybrid or electric cars. The hypocrisy of it all, there are more hybrids than that on my block. But then again, I live in the land of tree hugging lunatics. Finally, something from the mainstream… I guess it may have just been too juicy to ignore? No, I don’t think so, not really at all. just to provide an illusion of balance. If they were fair Dinkum, they would have an actual ABC journalist analyse and comment on the contents of the CRU emails. which seems implausible until you actually read the emails. Well, now that Copenhagen has started, the MSM can’t get away from reporting about climategate. Predictably, they seem to be soft pedaling it, quoting people like Panchuri, who despite the call for an official inquiry, still holds on to his antiquated belief. Meanwhile, the local CBS news still doesn’t get it and prominently featured several pro AGW pieces related to Copenhagen and the EPA’s idiotic ruling and failed to mention climategate once. The weather segment that followed talked about Livermore breaking a record low from 1906, snow falling in places where it hasn’t snowed for 30 years and record cold expected throughout the region tonight. Thanks to you who provided rebuttal suggestions. Unfortunately I seem to have been deleted. So I posted my own expose on the moderator’s supporting link — easy to do because it just assumed that CO2 was the culprit without proof (but what else could it do?). It even used Mann for support. It was full of nice pictures, even pulled the poor Polar Bear card. I all but dared the moderator again to check out The Skeptics Handbook. Sometime I wonder why I bother. Skeptics handbook is great. Add to it the narrative of the master on the beginnings of the response to CAGW, and resonant it is with all we’ve seen in the last weeks: http://www.climateaudit.org/pdf/ohio.pdf. Wow. That must have cost you guys thousands of dollars. Obviously sponsored by Big Oil. Hopefully the code for the photo’s has been fixed. Thanks to all the people who let me know. this is an excerpt from a Global research item I found this week, I think the 50 million to warm alaska up is a bit, hmm? dodgy? In addition to the experimental weather modification programs listed by NOAA, there are both private and ongoing government sponsored atmospheric testing and heating programs underway in Alaska and across the United States. Alaska Senator Stevens recently received $50 million in funding for Alaska’s atmospheric heating program. Thank you very much for sharing this with us. I knew you had been involved at that time, but I am amazed to learn of the degree of the obstructive tactics that you encountered. Thank you for what you contributed at that time, and everything you have done since then to promote rationality. RobinAtl, the ironic thing is, the Farmers’ Almanac would vote for the Climate Change Models over themselves. They are raging warmists! This article is important and timely, Joanne. Thank you for writing. I have just posted links to it on other forums, along with this story from FoxNews.Com that helps explain why industry organisations and business owners are afraid to not appear to go along with the fraud. Ah, the UN’s idea of a spirited debate….. Yup. I think it’s time to defund and disband this parasitical organization. Thanks for all that you do. You are indeed an inspiration. Thank you very much for pointing to that article about the attack on Tom Donohue. To somebody living in mild-mannered New Zealand, this is just staggering. It certainly is a sickeningly dirty business. And, as you imply, gives an indication of the power of the forces we are struggling against. Steve (#35), it’s a pleasure to share information with people who are not closing their eyes to this whole fraud! Now, just out of curiosity, has NZ not just passed an ETS? This website of New Zealand’s Climate Change department is a worry. I don’t intend to be confrontational at all (and I realise you probably won’t take it that way), but do you think it’s because of those mild manners that this has escalated to this point? Australians have never SPOKEN at a grassroots level before, and we found our voice JUST IN THE NICK OF TIME 1 1/2 weeks ago, thanks to Joanne Nova, Bob Carter, Ian Plimer, David Evans, and several other courageous thinkers in this country who were willing to stand up on the side of science. But to be honest, we had to abandon our mild manners and show that we were angry that our politicians were about to totally change the economic foundations of our country in response to a non-problem. Yikes. I have just seen this. It is apparently the opening video for the Copenhagen conference. As the father of an 8-year-old daughter, I am deeply disturbed by this disgusting, abusive rubbish. I am very sad to know that we have a long, hard battle ahead, and these guys will not hesitate to pull out the heavy artillary. Thanks for your comments, Janet. As an ex-pat Australian, I am well aware of the difference in the national psyche between the two cultures, and I am sure that this has played a part. Not just the mild-mannered bit, but also being ever so politically correct, and super-aware of our “clean, green image”. All means that the reality of the political canvas simply does not support a strong sceptics movement in the absence of a rallying point. Not only that, but the “young brother syndrome” meant that the NZ government rushed the legislation through because they wanted to go to Copenhagen with the same status as Australia, fully expecting that yours would be passed into law by then too. Haha. Not saying there are not a lot of very dedicated sceptics here. There are. And they do what they can. Whilst it makes good news to highlight the massive use of limos and jets for delegates at the conference, it rather hides the key point which is that it is a “controlled” conference allowing no dissent, and making (false) assumptions as its raison d’etre. I do not think the case for the real science is helped by petty illustrations of the delegates incongruity. Try this, open the “summary for policy makers” link. There you will find such words as “Estimated” “Uncertainty” “likely” “unlikely” “very likely” and “very unlikely” at least 13 times (that i could count quickly) on this one page alone. In the 800+ pages of the whole document these “QUALIFYING” words appear well over 1000 times. Just watched Tony Abbott on AIPAC. Says he will have a strong policy on climate change soon. Ok, we’ll have to wait and see before we judge. Have to say though, this is a little bit of a worry from someone who not so long ago said it was ‘crap’. Can’t for the life of me see why Dennis Jensen was not given a shadow ministry. His maiden speech in parliament damned this non-science without even faint praise and his scientific credentials are impressive. Maybe he told Abbott that he can’t find it in himself to talk political crap on a subject that he knows is total crap. Keep the powder (and the keyboards) dry folks. I, for one, did not send emails and faxes to be sold out at a later date. We are still dealing with politicians after all. Great post. It is so obvious how the UN is manipulating public opinion. Have sent it to numerous AGWs in Europe. Climate-gate is scarcely reported in the UK so the internet is a vital feed. Just as we plugged the pollies here in Oz we must get the message out there. 1-) Think it’s “certain or uncertain” that the science is settled. My thanks for all the suggested rebuttal ideas. This is the document the blog moderator links as her authority. I picked it apart quite easily since it starts with the assumption that CO2 is responsible for AGW as a given. It’s not much better than Gore’s movie. I may have been wrong about being deleted. My subsequent posts are all there this morning. I had previewed my post and then got sidetracked and looking back, I may well have forgotten to finish the process. Operator error. Re you reaction at #37. I do not expect it to be shown on the big screen in the conference hall, but if enough people complain the message may filter through. Thanks for pointing out that link. I sent them a little greeting of my own. Hard to believe what the USA is doing via the EPA….calling CO2 a ‘danger’ to human life?!!! What about the rest of the animal kingdom? What about their being NO Greenhouse gases at all – simply a mixture that rises when it hotter and sinks when its cooler ( or gets absorbed by water and comes down in the next shower of rain.hey there might be a pun in there, if so its intended. I was also not impressed by RUDD deferring the Health reforms to next year “in order to get it right!”. say I heard that before from another camp re: ETS – but he and Wong seem to want to ignore that for what seems to be the same reason – to get more facts and get it right. I fear politics is winning. Especially seeing all the people involved. Imagine the money being spent. I also read RUDD has “donated” $70Billion dollars to the same university as that the chair of IPCC is a board member (back scratching going on?). Where’s the pensioners few dollars a week! The EPA is no surprise. It was created by politicians and is dependent on politicians for its funding. If you create an organization and tell it to protect you from yourself, don’t be surprised when it does “its job”. They have to justify their salaries some way. I know little of Australian politics. But here no politician gets elected by telling people they have no problem. They always say you have a problem and they’re going to fix it for you. They never really solve the problems though. They just throw money at them. The EPA works the same way. They have a big backlog of really important things to do. But no, it’s CO2 that gets the attention, lest their bosses get upset with them and reduce their funding. Good link. I sent my own message and plan to keep sending messages until the end of the conference. This is a link that needs to go viral among AGW skeptics. No real surprise…You can’t get “unethical” without the “UN”. I would like to say thanks for all your endurance,perserverance,clarity and just the right “spice” of humor. I didn’t see the $50,000,000 thing to warm Alaska, but I’ve said for years if our governments develop the ability to change weather, we are all in big trouble. Can you imagine the international law suits? And what “heating programs” are under way “across the United States.”? Has anyone told Al Gore about this? In the ancient past I had many, many flying hours over the Alaskan Arctic, and adjacent areas, (including the North Pole area and over to Thule, and beyond) observing and measuring the weather. My ‘smart aleck’ comment would be that I don’t think we can generate enough heat for that amount of money to really make much difference. But the military DOES (or at least did) report and forecast areas of contrails, both persistent and non-persistent. I suspect they still do since it doesn’t do much good to be stealthy if you can be easily seen by a naked eyeball. That this lady has never seen a contrail forecast is not surprising nor evidence of their non-existence. I am not qualified to pass judgement on whether civilian or military aircraft create the most contrails (nor care! ), but I see no reasonable basis for her contention. Nor do I think contrails contribute to climate change. And her claim that military weathermen “can’t predict the weather very well” is contrary to my experience. About the only military forecasts most people see are Terminal forecasts, and they are by and large extremely accurate. To put it bluntly, I don’t believe she knows what she is talking about. This would not be good news for the “warmista”. There is talk that Obama (whose ratings are literally in the bog) might try to bypass the Senate by regulation. The Senate could, I suppose, totally demolish the rest of his agenda if he tried that “trick”. Mark, you are correct…The Senate just needs the courage to act on it.